So, is now a good time to start a building project? While it is a scary time, there are opportunities abound for those that have the courage and means. I am no fortune teller, but I can dish out a bit of what I've heard and experienced in the last few months. Of course I'll also throw in some invaluable gut intuition. Banks - Lending is tight. Really tight. As a banker recently told me, "our current appetite for lending is small." He went on to say that the easiest type of loan to get these days is for an owner occupied building. That is their way of saying if you're building it for yourself to occupy (a home, remodel or commercial building) and you qualify, you may have some of their money. Uncertainty - The development attitude in the recent boom was build it and they will come. This is not the case anymore. You have to be careful what you build, for whom, and at what cost. Cheap Land - The price of land seems to be back to where it needs to be to make development projects work again. People assumed that the ever escalating price of new homes and condos was all developer greed. It was not. High land prices and construction costs dictated high sales prices. Foreclosures - OK, foreclosures are bad. Someone loses, banks fail. This is one of the main reasons we got into this mess, right? I get it. Now for the bright side. Foreclosures can be opportunities. The cheap real estate they offer allows for new opportunities - a quick condo flip, land for your new home, the chance to develop a small project, etc. Cheaper Construction - The price of materials and labor have fallen due to demand reductions. Almost all material prices have been in decline since the summer of '08. Contractors are hurting. Less work for them means they will take on projects for smaller overhead and profit percentages. Quality contractors are also taking on smaller jobs that they wouldn't touch a few years back. Cheaper Soft Costs - It pains me as I write this, but the bad market has also lowered the costs of architects, engineers and all the other people that get you to the point of construction and beyond. Why? They are also hurting. Faster Permitting - We do a fair amount of architecture work in Los Angeles, and the difference at City Hall these days is astounding. What used to be a four hour wait to submit for plan check is now a four minute wait. In our experience, their processing times are much faster as well. Time - Time is the typically bane of the architect and owner's existence. Building projects take time. They have to be designed, coordinated with consultants, documented and permitted. All this adds up to a long process that can be quite burdensome. Now, however, this time factor can help with some of our major negatives. Banks will start lending again. The market will recover. So when you think of a building project, think about the time involved. Many projects take about a year to get to permit/construction start (when you need that construction loan), then the construction can take another year (when you move in or need those prospective buyers.) So ask yourself where you think things will be in one to two years. Emerging Trends - Major slowdowns are often times of reflection and change. This is very true in the building biz. Of late, I've seen a strong desire for smaller, more efficient, green buildings. This trend comes both from awareness of climate change and our financial need to do more with less. I like this trend and think that it'll bring about some very innovative and evolved projects. Do you have any thoughts on this? Questions? One of the major components the energy efficiency of any building is insulation. Insulation is critical to maintaining comfortable indoor temperatures by either keeping the heat in or out of a building. As sustainability gains momentum in the building industry, new products are available that rethink insulation. 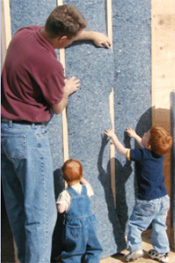 One of these is recycled denim insulation. Yes, old jeans. One of the leading manufactures of this green product is UltraTouch. UltraTouch Natural Cotton Fiber Insulation is targeted as a replacement for traditional fiberglass insulation - the typically yellow or pink soft looking stuff you see between the studs during construction. Yes, you're probably also picturing the pink panther. If you haven't had the pleasure of handling traditional fiberglass insulation, don't. It's not pleasant stuff to to touch (itchy) or breath (can cause respiratory problems). I definitely wouldn't wear pants made of the stuff. UltraTouch on the other hand is made of safe, easy to handle, recycled denim. UltraTouch comes in rolls and is easily installed. 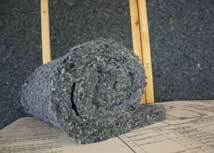 The insulation is 85% post industrial recycled fibers. Has acoustic ratings approximately 30% better than traditional insulation. Less outside or neighborly noise. The cotton fibers are treated for fire resistance - Class A rating. No VOC concerns - those little particles you don't want to breath. Obviously helps with LEED certification points. A common question, as with most green products, is does it cost more? Well, yes, it does. How much more depends on the size of your project and the construction market. However, the short and long term benefits of this product far outweigh the upfront costs. At Modative, we are now specifying this or similar products instead of traditional fiberglass insulation. If you are concerned about the cost, we're happy to help you compare the cost of this green product to traditional insulation. From news reports to personal experiences, we are all now very aware that the real estate world has cooled dramatically, however, the dip in property price and increase in foreclosures has brought about a new round of opportunity. Those who are willing and able to gobble up these affordable properties are in a good position to reap the benefits in the long run. Unfortunately, however, in the last few years, we've seen plenty of mistakes in buying property that could have been avoided with a bit of help from an architect. People often falsely assume that they must own a property before contacting an architect. This can be a difficult error to overcome. Architects have experience in understanding zoning codes that affect the value and buildability of the property. There are many great real estate brokers out there, but there are also many not so good. Remember that a broker's end goal is to sell you a property and collect a commission. This often leads to giving you the most favorable view of a property in hopes that you'll close the deal quick and easy. Most brokers will do a very superficial code search on a property, but the problem is that zoning codes are not always so simple, nor are they the only factor in determining the development value of a property. Although a thorough zoning code check is an important first step, architects have experience beyond just an understanding of the codes. They can typically give you a quick idea of what the site will allow based on other factors or costs. A few years back we had a young client named Greg come to us with a property in Los Angeles that was zoned RD2 (a multi-family zone). Greg had already purchased this property under the assumption from his real estate agent that he could develop a four-unit condominium on the property. In theory this was correct. The RD2 zone allowed a density of one unit for every 2,000 square feet of property and the property was 8,500 square feet in size. So yes, the code allowed four units, but there were other factors at play. The configuration of the lot, and the city's parking requirements made it impossible to properly park a four unit condo on the site. Although it may have worked with underground parking, the cost of going underground given the size and layout of the lot would have made the project infeasible. So after analyzing all of this for Greg, we determined at most he could do a three-unit condominium. The development numbers didn't add up, so Greg had just purchased a property that was of little value to him. If he had contacted us sooner, we could have warned him and he could have found a better suited property or negotiated the price of that property down until it made financial sense. In Los Angeles, the search for cheap lands often leads to the hills. Not the glamorous cliff hanging homes one thinks of, but leftover raw land with severe slopes. A young couple, Claire and Sam came to us a while back with one of these lots in mind. Their broker brought this property to their attention because it was cheap and had nothing built on it yet. To Claire and Sam it seemed like a dream property. The cheap land would allow them to build the small modern home they had been dreaming of. Fortunately, Claire and Sam called us when they found this property. Aside from not meeting code requirements to build what they wanted, we explained to them that the added foundation costs to build on an unstable hill like this far outweighed the potential savings of the cheap land. Needless to say, they didn't purchase this particular hillside mess. We like to think that our quick advice saved them from this big financial mistake. Not all scenarios are like this. These two just highlight some potential mistakes that can be made without getting an architect's help early in the process. To help prevent some of these property purchasing pitfalls, we have added a free zoning code search to our web site. This service is available to current property owners and people searching for property in the Los Angeles area. Learning about a property's zoning code is an important first step in any potential project. A step that we are trying to make a little easier and more accessible. Being a connoisseur of all things “modern” I often find myself planning vacations not just around a certain place or location, but also around experiencing interesting well-designed restaurants, museums, shops, and places to stay. Often I turn to Wallpaper City Guides, published by Phaidon Press as a way to research the best places to visit for the “design-conscious traveller”. Recently, however, it was as simple as a quick search on Google that brought me to a wonderful little inn at a vineyard in Paso Robles, California. 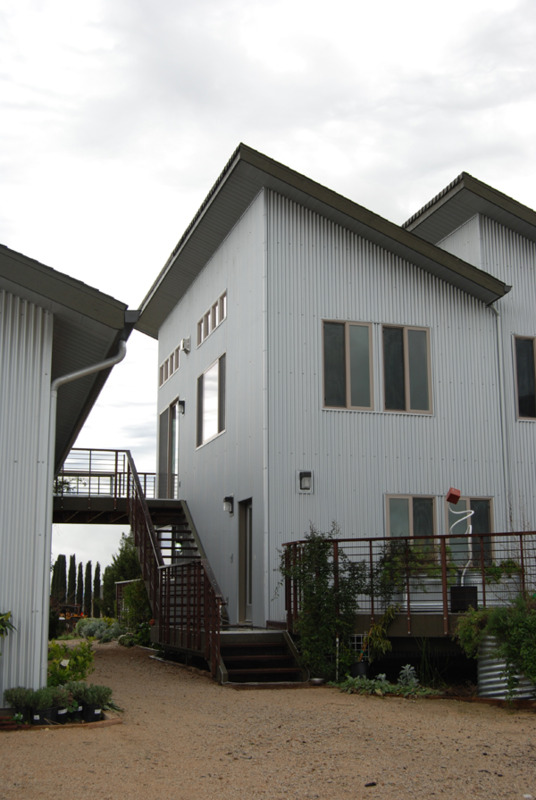 The Christopher Joyce Vineyard and Inn is a wonderful new modern structure “nestled in the vines” atop a vineyard that overlooks beautiful Central California wine country. This new bed and breakfast features two very well furnished suites in a comfortable and relaxing, yet contemporary, setting. The inn, located just a short drive from downtown Paso Robles' many fine eating establishments, is perfectly situated for anyone looking for a relaxing weekend getaway or a wine tasting extravaganza. The innkeeper, Joyce Clarke, compliments the place perfectly. 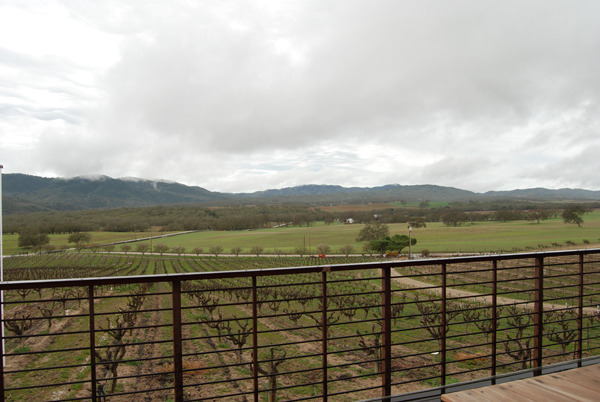 Upon arrival, she served a glass of Zinfandel accompanied by the most delightful, freshly prepared appetizers, all the while offering wonderful recommendations of places to eat and to go wine tasting in Paso. After a day of great wine tasting and a wonderful meal in Paso Robles, I returned to the inn to find an assortment of desserts and dessert wine waiting for me, which I consumed by the fire in a warm and lofty space far away from the daily grind. 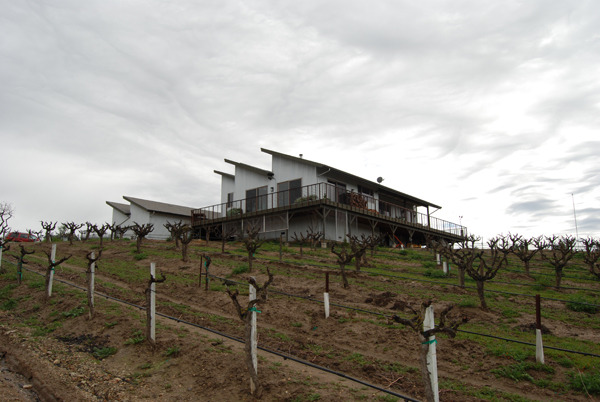 If you are sitting at your desk right now thinking, “I need to get away this weekend”, a quick four hour drive from Los Angeles will get you to The Christopher Joyce Vineyard and Inn. If your idea of relaxing is spending the weekend in a Tuscan Villa, I highly recommend going to Italy, not Paso. 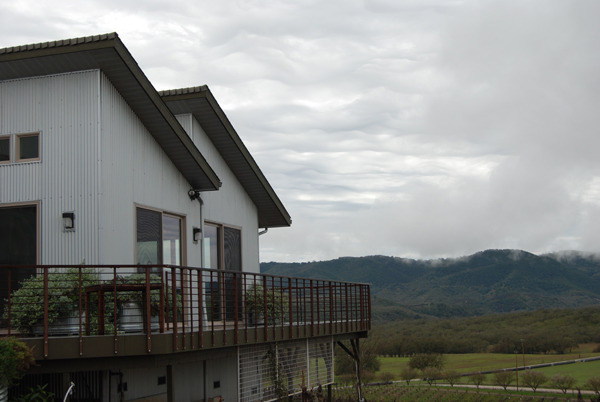 But if you want panoramic views, great cuisine, and incredible wine in a well-designed bed and breakfast closer to home, try the Christopher Joyce Vineyard and Inn.